I rarely blog on match-days. Maybe it's the superstitions, maybe it's because the mix of nerves and anticipation gives me a foggy mind. Clear and level thinking is an art at the best of times. Of course, much of today's pre-match reaction from the finest 'experts' in football analysis will jump on to the Suarez v Bale hype. Both have hit mesmerising form of late. A prolonged period of consistency inevitably leads to jumping up the footballing perception of many and into the "best in the league" category. I won't lie, I do feel one of these will win the POTY award. My gut feeling being that of the Uruguayan. 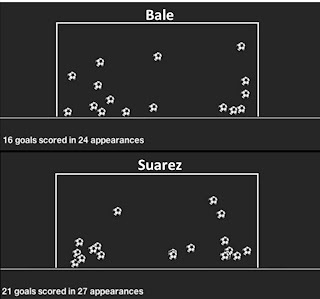 Courtesy of the fantastic @Squawka_Sports (well worth a follow) , here is a statistical look at how Bale and Suarez have faired against one another this season. Suarez has scored every 114 minutes in the EPL this season, Bale has scored every 131 minutes. 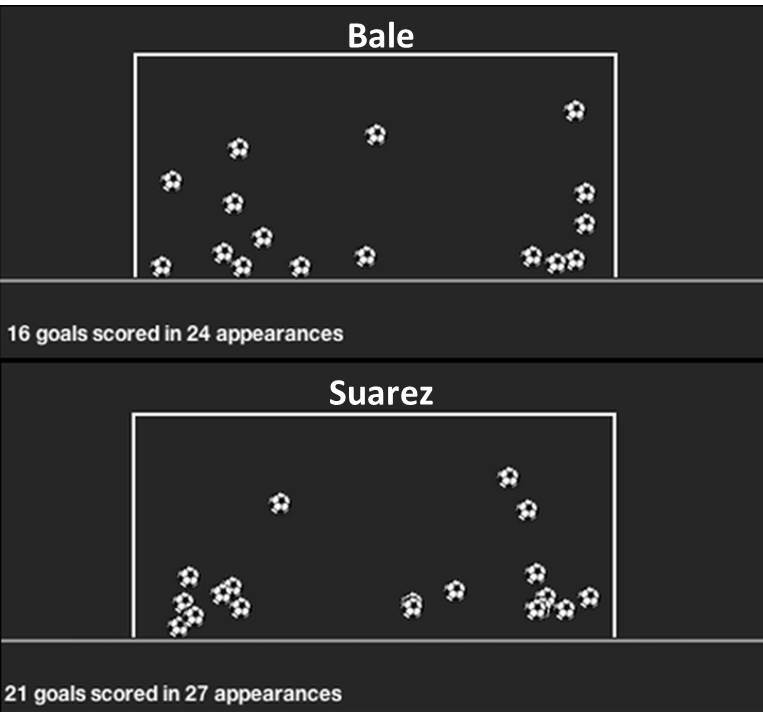 Suarez has had more shots on target than any other EPL player (94), Bale is 2nd (76). It's difficult to compare two players that, naturally, do not fit into the same category of player. At the start of the season, we'd have classed one as a centre-forward and one as a left-winger. It's almost a reflection of the work AVB has put in to ensure spurs are a far more flexible outlook this season, adapting to the various attributes of players and fitting them into a system depending on the various opposition thrown in front of them. I'd mentioned how fluid Spurs looked vs. Inter here. Bale only emerged from under the rock he'd been hiding under in November and since then has kicked on to become the heart beat of the side. Harry toyed, briefly, with the idea of giving Bale a free-role but there was little organisation and preparation riding alongside it. It's evident that AVB has worked on Bale's strengths and slowly moulded him into the number 10 that his attributes on paper would see him best suited to. He looks better suited and more comfortable further up the pitch, a far-cry of the player that attempted a similar role last season. 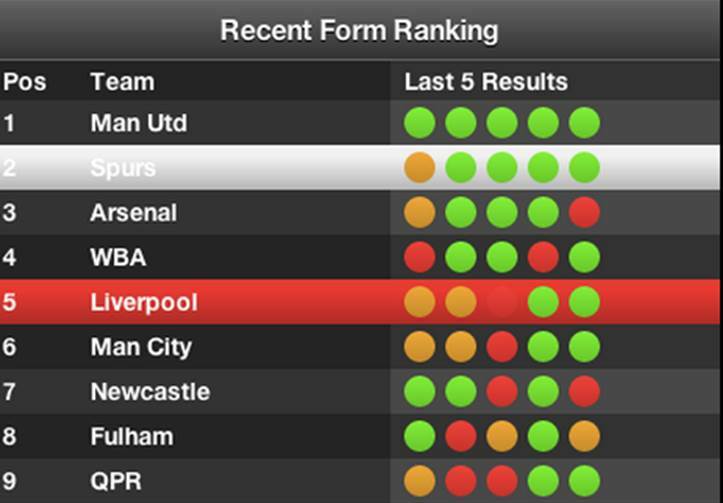 Both Liverpool and Spurs are hitting form at the right time of the year. Both sides fair very evenly when it falls down to numbers. For a Spurs fan, whether you're looking up or down at the EPL table falls down to your philosophical outlook on life. I'm naturally a glass half empty kind of guy so will hope for 2nd but, naturally, expect it to come to the final day for 4th spot. A lot of these games can fall down to mental resilience. I've spent much time promoting the concept that the Spurs of this season (especially post-Everton) has looked one of the more resilient sides I've ever had the pleasure to witness. We're building on the belief that we can visit any ground and claim three points. Naturally, I felt the 2-1 win at Anfield a few seasons back was a huge stepping stone. We've broken down the psychological brick wall that had been built so high, attributed to the many defeats away at Anfield. We've yet to experience defeat to Liverpool for a few years now but, this season, it may fall as a surprise to notice that both them and ourselves compare very similarly when it comes down to numbers on paper. Stats don't tell the whole story. Naivety comes to mind if you think they do. 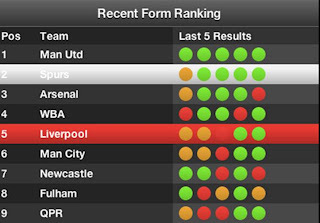 Liverpool are hitting some great form but have only managed one victory over a side in the top 10 - an arguable Swansea reserve side. Therefore, for them, this game will prove a great challenge not only on paper, but psychologically as well. A victory here could see them build the momentum to do the unlikely and push for a genuine top 4/5 spot. The players will be hungry for this, having been starved of it for so long. This a difficult game to call that could honestly fall either way. 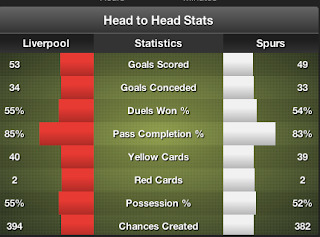 We're a far stronger unit than the Spurs side that played Liverpool at White Hart Lane. I'd almost felt astonished as to how poor we were yet delighted we'd ground out 3 points. With Lennon likely to be missing, I'd favour us setting up 4-3-3. Holtby, Dembele & Parker in behind Sigurdsson, Bale & Defoe. Keeping the game tight and compact may help to cut-off the supply from Gerrard & Coutinho to Suarez & Sturridge. We should encourage pressing their midfield and look to break on the counter. Smothering Gerrard will be key. We seem confident in playing a high, yet rigid, line and feel we may approach the game a similar way to the Arsenal fixture. As mentioned I could see this falling either way. I'd always want the players to set out for a victory but hindsight may tell me that a point wouldn't be the worst result. Those with ambitions for second would see this as another 'must-win'. I don't knock that and I admire the bravery for putting your heart on the line in such a manner. We've 10 fixtures remaining, 10 cup finals, and yet anything can still change in 2 games.